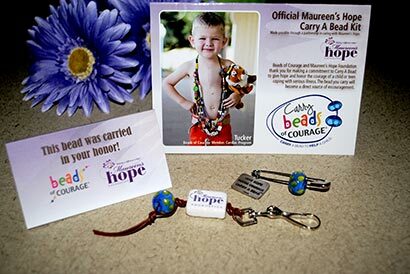 Maureen’s Hope Foundation and Beads of Courage have partnered to offer you Carry A Bead kits to allow greater outreach for both patients and supporters. 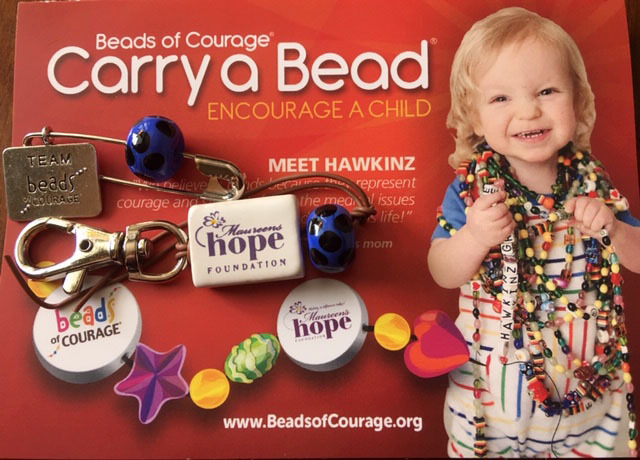 This program gives everyone an opportunity to actively get involved in the mission of Maureen’s Hope and Beads of Courage through the Carry A Bead Program. Kits are now available through our website for $20 (shipping and handling included). children coping with serious illness. 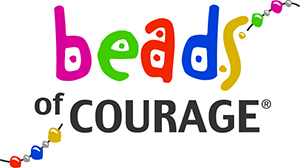 Please take a few minutes to watch this powerful video that explains the Beads of Courage program and how your team can get involved and share their personal encouragement with a pediatric patient. Contact susan@maureenshope.org for more information. 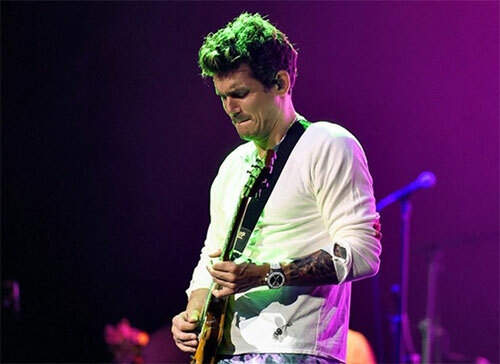 Singer John Mayer carried a bead during his concert at the Lakeview Amphitheater in 2017. 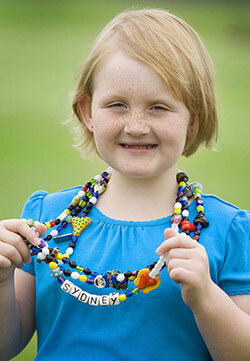 Read about how he and his band wore Beads of Courage to honor local pediatric patients. Purchase a Carry A Bead kit. 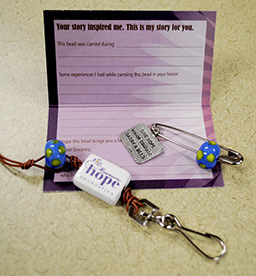 Proceeds raised from our Carry A Bead Program support Beads of Courage Programs sponsored by Maureen’s Hope. You will receive a matched bead set. One bead we ask you to carry. Pin it, tie it, wear it during your determined Carry A Bead adventure. We want you to literally Carry this Bead with you. We believe your good intentions and caring thoughts go into the bead during this intentional act of caring. At completion of your Carry A Bead experience, please return the bead you carry to Maureen’s Hope (address included in kit). The bead you carry you will package with a signed note of encouragement. Keep the matched bead as a reminder of your commitment to be a direct source of encouragement to a child in Beads of Courage. Every time you Carry A Bead, you collect a bead to add to your strand of support. Thank you and Carry On! What happens to the bead you carry and return? It becomes a very special bead in the Beads of Courage Program known as an “Act of Courage” bead given on a tough treatment day. Beads of Courage NEEDS these beads. These are beads that we cannot buy, but depend upon donations from artists and caring donors to keep our bead pharmacy stocked. Your action will become a direct source of enCOURAGEment for a child or teen currently receiving treatment when they receive your bead and know that you made a commitment to care. You will keep the spirits strong of parents who know that a greater community of supporters surround them during their family’s journey and fight for life. You will keep the frontline nurse strong in his or her caregiving role as they now have just the right bead to acknowledge the courage required of her patient to get through a tough treatment day. Thank you for making a commitment to Carry A Bead. Give Hope. Honor Courage. Carry A Bead.